Posted by sumeethevans on February 9 2012, 2:10 AM. Posted in Office 2010. Today, we’re excited that the Office team is making OneNote for Android available in 57 markets worldwide with easy access to your notes on SkyDrive. The app also offers key OneNote features like checklists, image capture, table editing and support for hyperlinks. Please note that not all Android devices are created equal. You currently need to have a device running Android 2.3 or higher and with access to Android Market to use OneNote for Android. If you have an Android device, we also encourage you to try other apps from partners built using SkyDrive APIs. For example with Browser for SkyDrive or Cloud Explorer for SkyDrive, you can view, access and upload documents or photos on your Android phone. Portfolio for SkyDrive lets you organize and upload photos from your Android phone in batches to SkyDrive. If you want to add SkyDrive support to your app, site or device, please visit our developer center. Posted by sumeethevans on February 8 2011, 10:36 PM. Posted in Office 2010. Posted by sumeethevans on October 21 2010, 3:14 AM. Posted in Office 2010. Didn't it seem like only yesterday when we made the Microsoft Office 2010 Beta available? Actually, it's been nearly a year! Since then, Office 2010 has experienced over 9 million downloads — more than 6 times the size of the Office 2007 Beta. With so many folks out there using the Office 2010 Beta, this is our gentle reminder that the Beta is set to expire on Halloween. For those of you who live outside of North America, that's Sunday, October 31, 2010. If you've been busy putting all of the new programs through their paces, you've already experienced many of the cool new features that can make your life easier. Personally, I've decided that I can no longer live without the Ignore Conversation button in Outlook 2010, linked notes in OneNote 2010, photo editing in Word 2010, using video in my PowerPoint 2010 presentations, or making walls of numbers come alive with Sparklines in Excel 2010. You get the picture. Posted by sumeethevans on October 19 2010, 9:40 PM. Posted in Office 2010. Posted by sumeethevans on September 13 2010, 11:33 PM. Posted in Windows Live Hotmail, Office 2010. Posted by sumeethevans on June 30 2010, 6:03 AM. Posted in Office 2010. Microsoft is preparing to launch a new Office 2010 SKU, known as Office Small Business Basics 2010, that will be targeted primarily at users in selected emerging markets. The Smart-max.de site has a screen shot mentioning the coming suite (and are the ones who alerted me to it). The new Small Business Basics SKU includes Word, Excel, Outlook and OneNote,a ccording to the Smart-max folks. I asked Microsoft for more details about the Office Small Business Basics SKU (a k a, stock-keeping unit, or, in other words, a specific bundle) and received back a no comment. I’m betting the Softies are planning to use the Microsoft Worldwide Partner Conference as the announcement venue for the new SKU. Posted by sumeethevans on May 13 2010, 3:05 AM. Posted in Office 2010. Today, Microsoft announced the worldwide availability of Microsoft Office 2010 and Microsoft SharePoint 2010, as well as Microsoft Visio 2010 and Microsoft Project 2010, for business customers worldwide. More than 90 million businesses can now deploy the 2010 suite of products, and customers can expect to see significant productivity gains and greater return on their software investments. Posted by sumeethevans on May 13 2010, 3:03 AM. Posted in Windows Mobile, Office 2010. After having gone to public beta late last year, Office Mobile 2010 is now available in conjunction with the retail release of the full desktop version of Office 2010, bringing comprehensive Word, Excel, and PowerPoint editing capabilities to the pocket -- on Windows Mobile 6.5, that is. 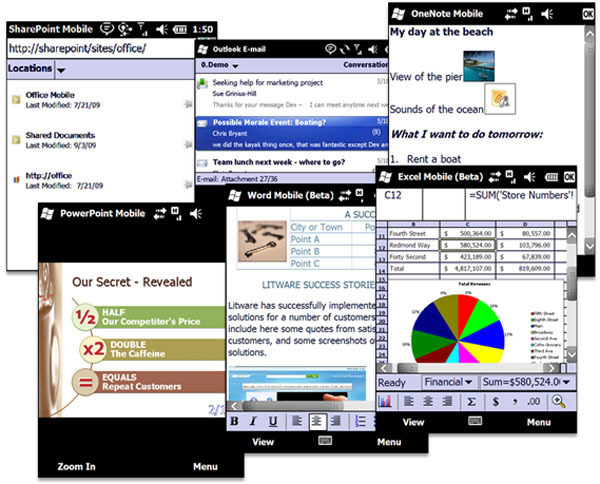 The download is available today from Windows Marketplace for users of 6.5 devices with an older version of Office Mobile installed -- so go on, Tiger, whip up the hottest quarterly reports the world has ever seen. We know you have it in you. Posted by sumeethevans on May 13 2010, 3:02 AM. Posted in Office 2010. Microsoft Access 2010 provides a rich platform for developing database management solutions with easy-to-use customization tools. If no end-user customization is required (including report modifications), you can choose to distribute those Access 2010 solutions so that they run without requiring a full installation of Access 2010 . To do so, you must package and distribute your application with the Access 2010 Runtime. The Access 2010 Runtime is similar to previous runtimes in that all design-related UI is either removed or disabled. You do not need to buy any special product in order to redistribute the Access 2010 Runtime. You can freely redistribute it or point users to this download. Posted by vasudev on May 12 2010, 12:33 PM. Posted in Office 2010. Google is of course doing this now as the business launch of Office 2010 happens tomorrow (Wednesday May 12, 2010). I’m not going to focus on the launch in this blog as there already has been a ton of great news about Office 2010, SharePoint 2010, Exchange 2010, etc. What I want to do is spend a little time focusing on Google’s argument. I used to think it was something that Google implied. Given the quotes and articles today, I now see that Google is being explicit in their claim. They are claiming that an organization can use both seamlessly. Posted by sumeethevans on April 13 2010, 3:54 AM. Posted in TechEd 2008, Windows 7, Office 2010. The Get On the Bus Tour is back home and we’re kicking off our new tour with a visit to Canada! Montreal marks our first location on a 10-city North American road show en route to TechEd in New Orleans, June 7. Come spend some time with us as we tour the East Coast for a deep dive into both Windows 7 and Office 2010, along with a specific path on how to get certified. Learn why Windows 7 has received rave reviews from IT organizations and is setting records as the fastest selling operating system in history. To Register for your local event, click on the image above.